Mom was going to post about a 7 year old boy at the shelter where she volunteers. Aiden was brought in as a stray. 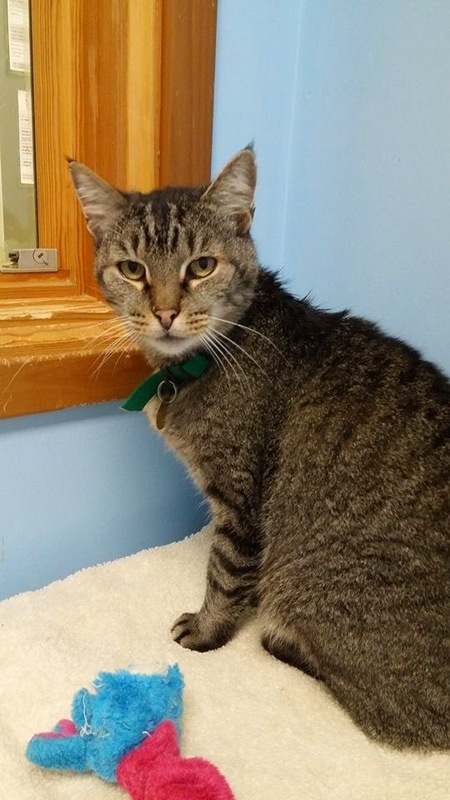 Not neutered but super nice and very handsome brown tabby. She spent some time with him last Tuesday night and he was happy just to sit and have his ears scratched. But then something happened last Thursday on the night when she volunteers that she wanted to touch on....and it involves Aiden. Any reputable rescue has a return policy. And ask anyone involved in rescue how they feel about returns, and they will more than likely roll their eyes. Cause we have all heard the "had the kitten for 24 hours but it was too active" story. Or "we had the cat for 2 days but it wouldn't come out from under the bed" story. "We're moving". "We're pregnant". Whatever.....rescuers tend to get a little cynical cause we have heard it all and then some. But what about legitimate returns? When the adopters have tried everything, asked for help, tried some more and it still isn't working? Those are returns that, while we never like to see animals come back, we understand. Such was the case last week. A very nice lady brought back a cat they had adopted about 3 weeks before. He got along great with the family. Loved the family dog. Terrorized the 7 year old female family cat. They had done the introductions right. Tried separating them and introducing them again. Nope - he stalked the older lady cat and was making life miserable for everyone. The lady said over and over she felt so guilty but didn't know what else do to. Mom got talking to her and assured her - the pets in the house have to come first. It isn't fair to resident animals to be terrorized in their own home.... so mom took the boy back and set him up. When mom came back up front, the lady was still there. She wanted to rescue and adopt but was now concerned about doing the right thing. Mom smiled and took her to meet Aiden. It was love. Now, since most people bring back and animal and run, no one was sure about doing an exchange. So an email was sent and the director responded the following morning that everything sounded fine and she would contact the woman. So it isn't always about the first pick....but about the right pick. And like dating, it may not always work out on the first try. Good luck Aiden - we got a good feeling about this. I had an experience with a failed adoption years ago, shortly after Chumley died, pressured from "expert" people in an on-line cat group to adopt quickly before Annie got used to being an only cat. It's not something I'm proud of, I did it all by the book for 16 days (and btw, paid out of pocket to neuter him, because our shelter doesn't do it automatically, bloodwork done, etc). Still, it was the wrong choice for the us and I remember calling a friend in tears, who took us back to the shelter. I was crying so hard and half-hysterical, so that I could barely even speak. I felt beyond awful. So I can well imagine how this woman felt. I really hope Aiden works out well for all and that he fits in. In my case, I happened to be at the shelter the day people came into look at the fellow I'd failed (because it was my failure alone), and of course ended up in tears again, telling them he was healthy, neutered, just needed the right environment, etc. I never thought it would happen to me, but sometimes we DO do everything we can and it still doesn't work. I learned a great deal from that experience, and mostly not to listen to "experts" and to trust my own gut and judgement instead. That's crucial. What we hate most is when people who try very hard and do the right thing get vilified for returns....sometimes it just doesn't work and that has to be ok. We know you tried and did the best you could - and in this case the best was letting him find a home with someone else. I hope ti works out for him and the one they exchanged him for. I hope that everything goes well with Aiden! This human clearly was doing the right thing for all kitties and family members. Oh, what a beautiful story! We hope everything works out well for Aiden! We're once again trying to get caught up reading blogs! We hope all of you are well! I was at the shelter one day with kittens when a couple returned a cat for similar reasons. I couldn't see any harm in them adopting another cat, but the shelter insisted they needed a month to give the resident cat time to 'forgive' them.. or some such nonsense..
That's a wonderful story. We are sorry for the first kitty that things didn't work out, but it sounds like Aiden got the family he was waiting for. Hope the right family comes for the first kitty! What a nice story. We hope that Aiden is exactly what the family -- and the resident ladycat -- needs! We had a failed adoption last year, and the head peep cries about it still if she thinks about it too much. (like, umm... now) But Ashton reaching a point that she wouldn't come out for meals was too much. You're right, the resident kitties have to be given first consideration. In our case, Beau was later adopted into a new home along with his brother, which is a best-of-all-possible-outcomes scenario for him. We're crossing our paws that the kitty that the lady had to return to your group finds a perfect fit home, too, even if it wasn't on the first try. What a wonderful story! Concats to Aiden!